The couching stitch gives you the opportunity to include a vast array of fibres, ribbons, braids or cords into your embroidery projects. Those threads that you picked up at the last stitching show because they looked so beautiful, but when you got home wouldn't go through your fabric can be couched in place with finer threads. By careful choice of colors you can make the couching stitches almost disappear, so that all you see is the decorative fibre that lays on the surface. The fancy thread can meander across the background in swirls or curves, or it can lay straight and true, it is your decision. You can either doodle a line on the fabric with a disappearing ink pen, or just lay the thread where you fancy, with no line to guide you, as I did with the leaves in the photograph above. 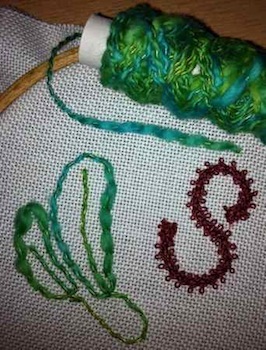 The letter S on this piece was created from a burgundy braid sold for miniature doll's clothing, stitched in place with a matching strand of floss. For the navy blue ribbon in the next photo I used a pale blue floss, placing each couching stitch in position carefully to form a brickwork pattern. 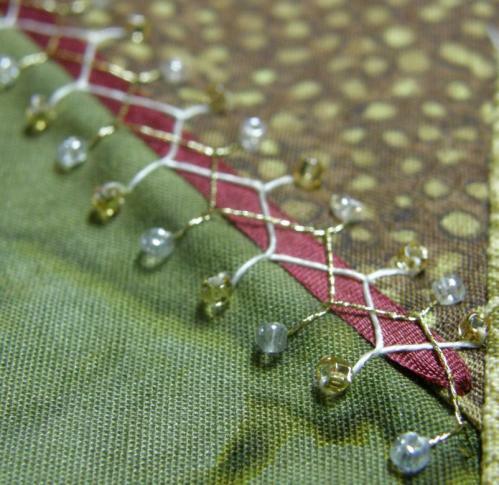 This form of couching stitch is also used in goldwork , where the gold threads are laid, side by side on the surface and caught down in an all-over diaper pattern with silk. Alternatively you can cover the couched thread completely, to give a raised appearance for things like birds feet, as in the photo (right), branches and twigs. Here I used a white mat cotton and stitched over it in two strands of floss. If I was using this on an actual project, rather than as an example, I would take more care to cover the cotton where it turns back on itself. 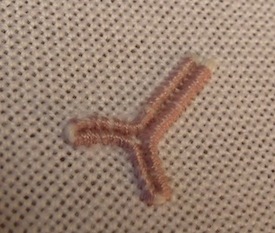 This technique can look really effective when worked over the top of other stitching, for example as a vine twisted around a log. This photograph shows where I used cretan stitch to couch a length of ribbon to a crazy quilt block. Any stitch that spans the fibre or ribbon you wish to attach to your project, can be used as a couching stitch in this manner. 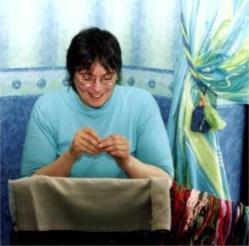 Another technique that makes use of couching is needlelace. For this, a pattern is drawn on paper, which is laid onto a folded scrap of fabric, then covered with a smooth sticky-backed plastic (or architects linen). A doubled thread is laid over the outline and couched in place with tiny stitches that go through all layers (fabric backing, paper and plastic). After completing the lace, the couching stitches are removed, freeing the piece of lace from its backing. 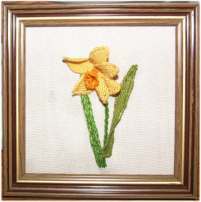 If this appeals you could try my pretty daffodil in my starting needlepoint lace section of the site. 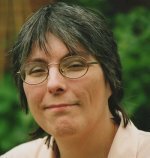 Stumpwork, or raised embroidery projects can also incorporate the couching stitch. For my stumpwork bunny I used Bokhara Couching for the basket that he is sitting in. For this, just one thread is used and you alternate between laying a long horizontal stitch across the area to be filled and then working tiny stitches to hold it in place on your way back. As Bokhara Couching has the appearance of a woven textile it was really effective in representing the basketwork in this design. This is a simple and fun technique and the only thing that can cause problems is securing the end of the fancy thread or braid. If it will go through the fabric without damage to either the thread or fabric, then tie a knot in the end and bring it up where you want to start work. Easy! If this isn't possible, then you will need to leave the end of the braid, ribbon or whatever on the surface. You may be able to turn the end under and stitch through it to hold it in place, if it isn't too heavy. If all else fails, try to cover the end by other embroidery, or maybe a button, so it is less obvious. Couching is more suited to decorative pieces of embroidery rather than practical items that will need washing often. The long threads can snag and the couching threads can break if handled roughly.